Dandavat Pranams. Pls accept my humble obeisances. It is all due to causeless mercy of my Guru that he asked me to accompany him as his servant in USA. I reached here on 21st Nov 2014 with him and were staying with a family in New York. First day, I had practically nothing to do other than listening to his Golden words. On 22nd, I started feeling the itch. I had a comfortable sleep, nice prasadam, books to read but there was still an itch. I went to Guru Maharaj and asked if anything needs to be done. He gave me some of his clothes to be ironed….I was over the moon. Couldn’t help inhaling the smell quickly. It took me an hour and I gave him back. I was rejuvenated. But after few hrs, the itch came back! I knew if I go to him, he would kick me out. So I asked the devotee cooking for him if there is anything I could do to help him. He knew by previous conversation I am ZERO in cooking, so he asked me to just throw the garbage downstairs and clean the bin….again I felt so nice….but in few hrs the itch came back – the itch to SERVE! I then sat in solitude and started thinking why this itch never came for my parents, brothers, wife and family. I would never want to iron their clothes or throw garbage and more so ever clean it. I am too aristocratic for that. How come for the ones who have reared me, who gave me birth, whom I played with, I have no inclination to do any work leave aside menial ones. Infact my parents have started complaining that they wish if I could serve them similarly, they would also bless me – infact bless me even for trying, leave aside perfecting the service…If my parents would chastise, I would judge whether I really went wrong and answer them accordingly. I would not talk to my elder brother for days if I think he was unfair to me. And here I am – itching to serve, virtually anything and ready to take chastisement and learn from it…I have no problem in owning up that I am a fool and not be judgemental why I was chastised – rather say and feel sorry for troubling my spiritual master. Why so much insensitivity to my parents and other family relationships? I realized with my parents and others, I had always felt I am the enjoyer. I am used to the fact that my mom and dad would do what makes me happy and once I am satisfied, I would not bother about them till my next desire come..how selfish of me..I would fret when my wife would want me to do A,B and C but it would be delight when she would massage my feet when I am tired…I was trying to be the master all the time and I didn’t want to be their servant as I felt even their love was based on reciprocal basis. I was in pure ecstasy and went to Guru Maharaj and shared my realization. He beamed and was happy. He said once we understand this, next stage is we are not body and then complete surrender and then attachment with the Lord…It kind of scared me – should I be calling my wife and parents in few months and say goodbye? what if they say no? Do I really owe my parents anything? Guru Maharaj reading my thoughts, said: as a grahstha we have some responsibilities. Once parent knows what is good for the child, he tries and makes all efforts to give the same to his son and daughter. If you have understood where is the real happiness, then as a son it is your responsibility to make all efforts and getyour parents and family this taste. I protested my mom hasn’t changed in last 18 yrs despite my father’s and brother’s efforts. He responded you didn’t come to Krishna Conscious despite best efforts of your brother. He said it is important that we help others when we realize something so that their spiritual quotient also increases – this is real compassion. Whether they change or not is upto their free will but you have to give your mercy. He then also clarified – Try means really try your best as if you are giving engg exam. I felt so wonderful with this realization…Guru Maharaj had guided me long time back that you can learn lofty philosophy, become wonderful preacher but it has no value if our basics, our heart doesn’t change which happens by self realization and then our preaching becomes effective. Be humble, tolerant, compassionate, service is the key, we are not body and surrender are stepping stones. Self realization should lead to implementation..and perfection of the same is sadhana. I understood I need to serve my spiritual master, my devotee friends and all other knownships and acquaintance. I understood I need to serve my parents with similar intensity only the goal changes – “I would want them to become servant of my Lord as well….because more the servants, more happiness we can give to our master. So I will serve them and I will try or even beg they serve Srila Prabhupad messengers diligently which shall delight the Lord and their soul just like the way I felt. While serving, our own pain is not felt – happiness will help them to overcome bodily pain and misconception that they are body. I am very fallen and hope by getting your service I can become one of the members of your flock of birds soaring in spiritual realm under guidance of exalted devotees. This entry was posted in Guru, My realisations, My spiritual Journey and tagged Giriraj Das, servant of the servants, service, service to parents, Srila Prabhupada, traveling with Guru. Bookmark the permalink. Thank you prabhuji for sharing your experience & guidance by the guru maharaj. Its good learning with your sharing. Even I had some doubt related to your question you asked maharaj which has been answered. Please keep on sharing to help us. Jaya !! Such a nice realization !!! All glories to Sri Guru and Gauranga !!! 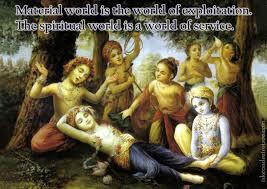 All glories to Srila Prabhupada ! !